In order to prevent having explosives manufacturing technology stolen by enemies, this typical ninja house had protections such as set traps and fake hallways. The ninja house is a simple farm dwelling, but has surprises, escape routes, hidden doors, places to hide swords, and the above traps and trickery. Here a kuno (female ninja) guides visitors through each part of the house, showing and demonstrating each trap or trick it contains. 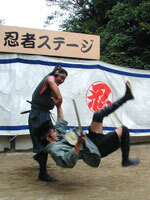 Visitors can watch Iga ninja stealthily infiltrate Ueno Castle. On the video screen in the Mini Theater, one can watch to see how they infiltrated undetected by anyone, and escaped as well. There, visitors can also learn about the tools ninja used to carry out their strategies, and even try using some of the tools by themselves. 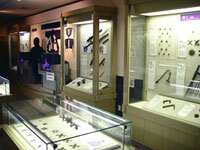 There are over 400 ninja tools on display, including shuriken actually used in the time of the ninja. 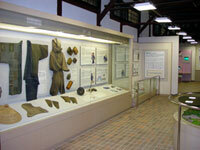 Here visitors can learn about secret codes, kuji, physiognomy, and ninjutsu that are useful in modern times. Also, the content of ancient ninja writings is analyzed scientifically, and examples of everyday ninja life and wisdom are introduced. 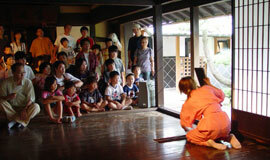 Visitors can watch a show where ninja tools that were actually used in the ninja heyday are demonstrated. Shuriken, swords, and kusarigama are used in this exciting display. 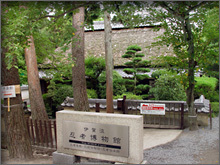 Iga-ryu Ninja Museum sells original ninja goods that cannot be found anywhere else. There are t-shirts, toys, ninja tools, and ninja clothing, all of which are rare items only found here. * Please display your physical disability certificate. * Entry is closed at 4:30 p.m.